What do Upclicker, Poison Ivy, Cuckoo, and Volatility Have in Common? Earlier this month, FireEye researchers Abhishek Singh and Yasir Khalid introduced Trojan Upclicker - malware that detects automated sandboxes by hooking mouse movements. If these user interactions never occur, the malware stays dormant, but as soon as someone clicks the left mouse button, it wakes up, injects code into explorer, and proceeds with infection. I recently developed a Volatility plugin for Detecting Hooks in the Windows GUI Subsystem that are installed the same way as Upclicker (SetWindowsHookEx), so I was interested to take it for a test drive. This quickly led to the realization that the malware behind Upclicker's packing is the popular Poison Ivy RAT. Additionally, Cuckoo Sandbox 0.5 was just released, with an option to acquire full memory dumps that are compatible with Volatility's VirtualBoxCoreDump Address Space. In this blog, we'll report our experiences with that new functionality and how the open-source Cuckoo can be modified in a way that forces Upclicker to execute. 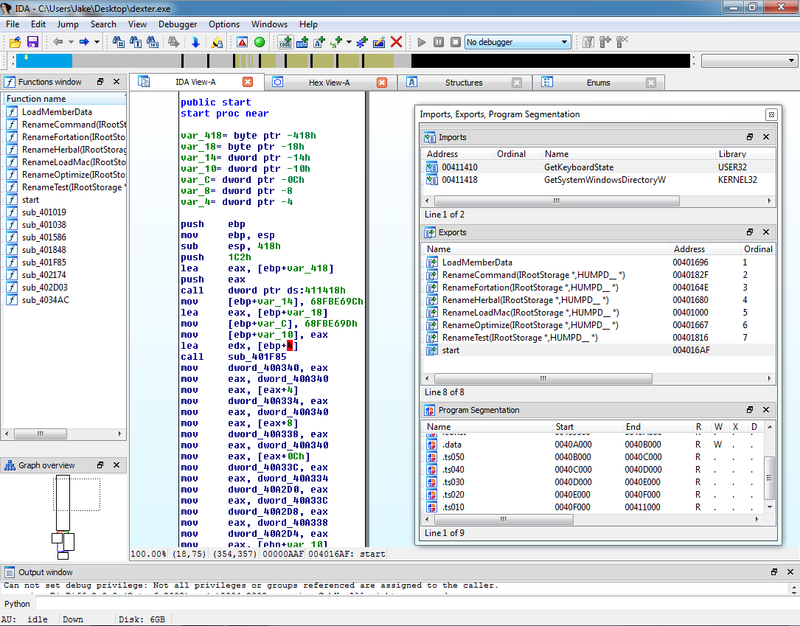 As described by Singh and Khalid, Upclicker used SetWindowsHookEx to install a hook into the windows messaging subsystem. The hook ID was WH_MOUSE_LL (low level mouse operation) and it filtered for wParam WM_LBUTTONUP (left button up). The malware could also have checked for other input event such as the right mouse button, key strokes; or used the GetLastInputInfo API to determine the number of ticks since the last user interaction of either type. This has been known to work with detecting some sandboxes, but not all. The trick is estimating how many ticks indicate a normal user's "idle" time compared to a sandbox environment. If the delta in tick count exceeds several hours, it may very well be a sandbox system, but then again, if the sandbox developer clicked buttons or pressed keys immediately before taking a snapshot, each time the VM is reverted, it resets the last input tick count to the original value (making it seem like a user was just there). Anyway, a while back I created a simple test program that checked idle time and I uploaded it to various public sandboxes. It needed a way to convey the value back to me though, which it accomplished by just creating a file named according to the number of idle ticks. The sandbox analysis results would identify the name of the newly created file and that's what I looked at for gathering the info. Unfortunately, this was years ago and I've since lost the data, but the code is below if you want to re-test it and I do remember that several sandboxes reported idle times over a week. # submission. Currently available for: VirtualBox and libvirt modules (KVM). SetWindowsHookExA is the last API called, because that's when it enters the "waiting" state. As you can see, the HookIdentifier is 14 (0xE) for WH_MOUSE_LL. The ModuleAddress (PE containing the hook procedure) is located at 0x400000. 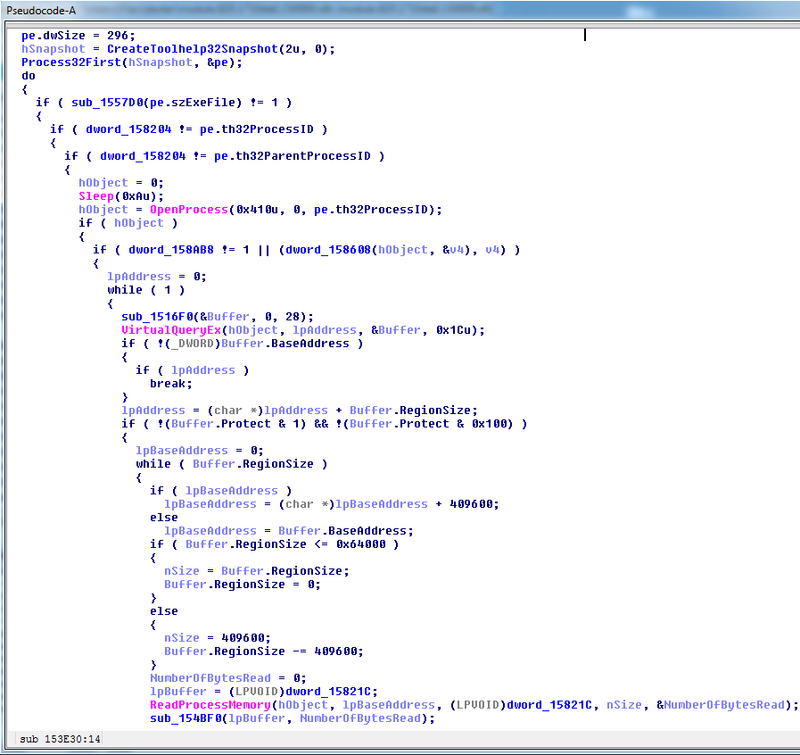 This is a typical ImageBase for the process' executable. The ProcedureAddress (hook function) is at RVA 0x10b0 from the containing PE and the ThreadId was 0 indicating the hook should be applied to all threads in the desktop. There you see the proof of Upclicker's hooks as extracted from physical memory. They are HF_GLOBAL hooks (the result of ThreadId = 0) and they filter WH_MOUSE_LL. The hook procedure is at RVA 0x10b0 of the module which is located on disk at C:\DOCUME~1\cooks\LOCALS~1\Temp\ce69dee5307d58db4e2a6fdbcbf87e9d. This is the binary submitted to Cuckoo - which the sandbox extracts to a temporary directory before executing. Cuckoo 0.5 is the first version of the framework that I've downloaded and installed. And its been out less than 12 hours, so admittedly I haven't explored much of the code. I did manage to find the analyzer/windows/modules/packages/exe.py file which contains the package for handling executable PEs submitted to the sandbox. I modified the Exe class's start() method such that it sleeps a few seconds after executing the Upclicker process (to allow the SetWindowsHookExA API to finish), then it uses mouse_event to send a MOUSEEVENTF_LEFTUP signal (the left mouse button is up). This should trigger the malware's trap for user interactions and force it to follow through and infect the system. For another example of patching Cuckoo, see Alberto Ortega's Hardening Cuckoo Sandbox against VM aware malware. The behavior analysis shows the created file(s). First the submitted sample itself (in the temp directory), then the dropped file named MCPUPlayer.exe which is attached to the system32 directory as an alternate data stream. You also can see the names of the new mutex and registry keys. The API monitor logs were also expanded to include explorer.exe this time, since Upclicker was allowed to inject code into explorer. 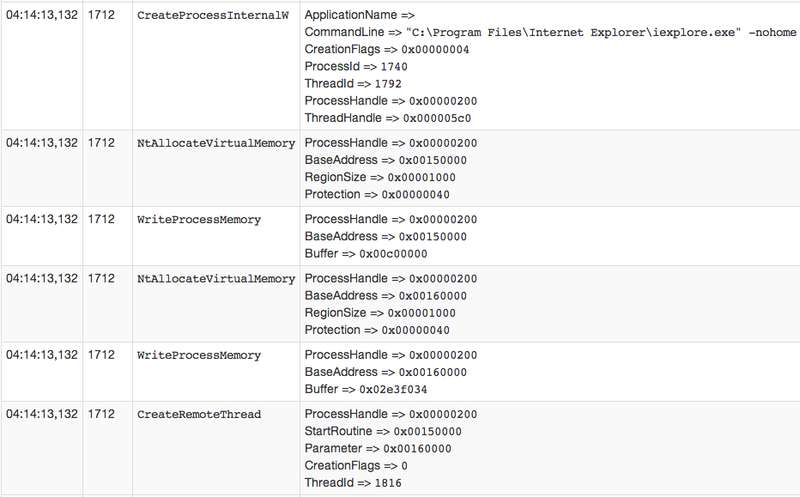 Now looking at explorer.exe's API calls, you can see it creates an Internet Explorer instance and then injects more code into the IE process. Hopping from one process to another with code injection isn't anything new. Zeus did it way back in 2006 (and probably was not the first). Next, we'll explore how that appears in memory. Curiosity killed the cat, or curiosity connected the dots - I can't remember what the real saying is. 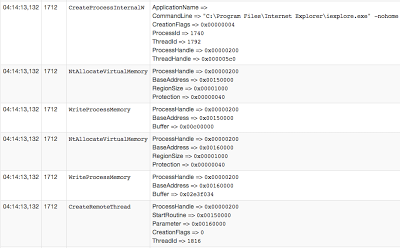 Using Volatility on the memory dump of the infected VM, you can see IEXPLORE.EXE is pid 1740. If there's injected code, we should be able to find it pretty easily. In fact, the malfind plugin located 20+ suspicious segments of memory - each which contain what looks like the beginning of a function. 0x00a70010  48 75 f6 8b 45 fc 81 c4 48 fe ff ff 53 56 57 8b   Hu..E...H...SVW. 0x00a30030  5a 8b 86 db 0a 00 00 50 8b 86 e1 00 00 00 50 ff   Z......P......P.
0x00160000  00 11 42 ab 71 07 4a ab 71 2b 3e ab 71 27 4c ab   ..B.q.J.q+>.q'L. 0x00160010  71 6f 67 ab 71 53 2e ab 71 e1 2e ab 71 55 53 ab   qog.qS..q...qUS. 0x00160020  71 e1 9a 80 7c 74 9b 80 7c c7 06 81 7c 6b 23 80   q...|t..|...|k#. 0x00150020  08 00 00 ff 96 89 00 00 00 3d b7 00 00 00 75 04   .........=....u. 0x00150030  c9 c2 04 00 56 8d 86 6b 09 00 00 50 8d 86 45 01   ....V..k...P..E.
0x00a40010  00 00 00 00 00 00 00 00 00 00 00 00 d0 3f 1c 00   .............?.. 0x00a60030  00 00 33 d2 89 50 38 6a 01 8b 03 03 45 f0 50 8d   ..3..P8j....E.P. 0x00c50020  cc 8b 45 cc 8b 80 24 03 00 00 89 45 e8 8b 45 cc   ..E...$....E..E.
0x00c50030  8b 40 08 05 b0 01 00 00 89 45 e4 64 ff 35 00 00   .@.......E.d.5.. 0x00c60000  55 8b ec 83 c4 e4 53 56 57 8b 5d 10 8b 45 08 8b   U.....SVW.]..E.. 0x00c60030  ff 35 00 00 00 00 8f 45 ec ff 75 e8 8f 45 f0 ff   .5.....E..u..E..
0x00c90020  83 7d 14 00 7c 50 8b 4b 08 03 4d 14 89 4d fc 83   .}..|P.K..M..M.. 0x00c90030  7d fc 00 7e 41 8b 4d fc 3b 4b 04 7e 1a 8b 4d fc   }..~A.M.;K.~..M. 0x00c80010  db 89 19 33 db 89 59 04 33 db 89 59 08 33 db 89   ...3..Y.3..Y.3..
0x00cb0020  00 00 89 03 8b 04 24 89 43 0c 5a 5d 5f 5e 5b c3   ......$.C.Z]_^[. 0x00ca0000  55 8b ec 83 c4 e4 53 56 57 8b 7d 14 8b 55 08 8b   U.....SVW.}..U.. 0x00ca0030  ff 35 00 00 00 00 8f 45 ec ff 75 e8 8f 45 f0 ff   .5.....E..u..E..
0x00cd0000  55 8b ec 83 c4 80 53 56 57 89 4d d8 89 55 dc 89   U.....SVW.M..U..
0x00cd0030  89 45 e8 8b 46 58 05 6e 03 00 00 89 45 e4 64 ff   .E..FX.n....E.d. 0x00cf0000  55 8b ec 83 c4 a4 53 56 57 89 55 dc 89 45 e0 8b   U.....SVW.U..E..
0x00cf0010  45 e0 8b 90 b4 08 00 00 8b 5a 34 8b 83 24 03 00   E........Z4..$..
0x00cf0030  45 e4 64 ff 35 00 00 00 00 8f 45 ec ff 75 e8 8f   E.d.5.....E..u..
0x00d00010  08 00 00 8b 5a 34 55 ff 53 70 88 04 24 6a 01 8d   ....Z4U.Sp..$j..
0x00d20020  45 e8 8b 83 ec 03 00 00 05 cd 00 00 00 89 45 e4   E.............E.
0x00d20030  64 ff 35 00 00 00 00 8f 45 ec ff 75 e8 8f 45 f0   d.5.....E..u..E.
0x00d30000  55 8b ec 81 c4 d0 fe ff ff 53 56 57 89 55 e0 8b   U........SVW.U..
0x00d30010  d8 8b f3 8b 86 b4 08 00 00 89 45 d8 8b 78 34 8b   ..........E..x4. 0x00d30030  01 00 00 89 45 e4 64 ff 35 00 00 00 00 8f 45 ec   ....E.d.5.....E.
Hmm, interesting...Upclicker uses the same fragmented code injected model as Poison Ivy. Doh, wait, this is Poison Ivy! Based on the VirusTotal results supplied with Cuckoo's analysis, only Trend Micro identified the Upclicker sample as Poison Ivy (BKDR_POISON.BNE). The other 44 engines either failed to detect anything (22/45 ratio) or identified it as a generic backdoor. Now that you've reached the end, you know that Trojan Upclicker is a wrapper/packer that in this case transmitted Poison Ivy as its payload. 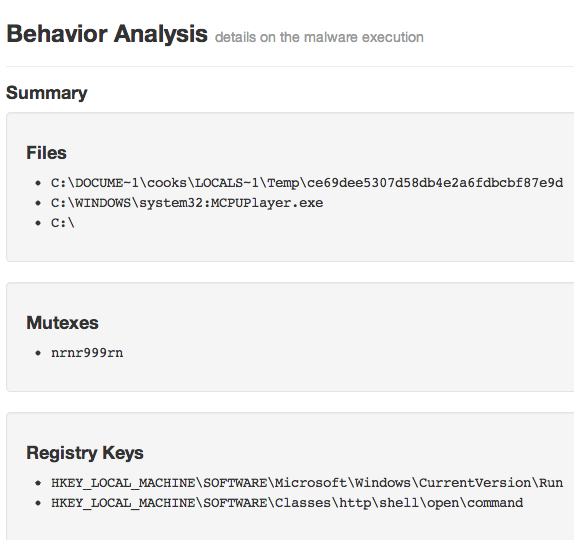 Cuckoo Sandbox can be easily modified to fit your analysis needs, even if you're a first time user. Starting with 0.5, it can be configured to acquire full memory dumps - thus it gets along quite nicely with Volatility's new VirtualBoxAddressSpace for those who wish to go deep diving in memory after an infection. You've also seen some recent malware leveraging the GUI subsystem to further its malicious intentions, which is always exciting. I'm a big fan of Dexter. As I recently mentioned during an impromptu discussion with our first group of memory analysis training attendees, if there are only a few minutes left in an episode and he hasn't killed anyone yet, I start getting nervous. So when I heard there's malware named dexter that has also been "parsing memory dumps" of specific processes on POS (Point of Sale) systems, I was excited to take a look. How exactly does this memory dump parsing occur? Is it scanning for .vmem files on an infected VM host? Maybe walking directories of network shares to find collections of past memory dumps taken by forensic teams? Perhaps acquiring a crash dump or mini-dump of the POS system itself? 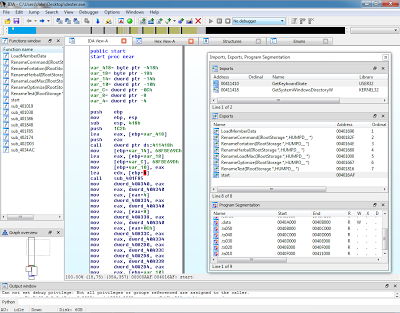 Turns out its none of the above, and the memory dump parsing is just a ReadProcessMemory loop, but figuring that out was nonetheless a textbook example of how to use Volatility in a reverse-engineering malware scenario. Getting started in the typical way, you can see dexter is packed. There are PE sections named .conas, .ts10, .ts20, .ts30, .ts40, and .ts50; suspiciously named exports like RenameHerbal, RenameFortation, and LoadMemberData; only two imported APIs - GetKeyboardState and GetSystemWindowsDirectoryW; and roughly 10% of the file is recognized by IDA as executable code (the rest is compressed/packed data). Nothing too interesting there. If we're going to understand how this malware parses memory dumps, we'll need to unpack it first. There's the manual option of finding OEP, dumping a sample with OllyDbg or LordPE, and fixing imports with ImpREC (or something similar), but I try to save that more time consuming and technical approach for when its really needed. In the case of dexter, and a majority of malware these days, all you need to do is run it and let it unpack itself. Being lazy never felt so good! After copying the malware to a VM, it was executed and resulted in the creation of two new Internet Explorer processes. The code has to persist on the system in some way, so if the process (dexter.exe) doesn't stay running itself, you can bet it dissolves (i.e. injects) into another process. A reasonable first guess of the targets would be the two new IE instances: pids 1480 and 820. The next thing I did since code injection was suspected is run malfind on the two IE pids. It located two memory segments - one in each IE process, same base address in both (0x150000), same protection (PAGE_EXECUTE_READWRITE), and according to the hexdump there's an MZ header at the base of the region. Now that we've quite effortlessly identified where the unpacked code is hiding, let's dump it out of memory. We'll use the dlldump plugin for this. Although the PE at 0x15000 isn't necessarily a DLL, the dlldump plugin allows the extracting/rebuilding of any PE in process memory if you supply the --base address (which we know). The strings output shows a list of process names, which makes sense - the Seculert Blog mentioned that it enumerates processes. You also see it references SeDebugPrivilege, likely for the ability to call OpenProcess and read/write the memory of other processes. The ABCDEF[....] is a base64 alphabet, so you can expect it to encode some or all of the data it POSTs to gateway.php on one of the randomly named .com domains. It would create the WindowsResilienceServiceMutex and make a run key in the Software\Resilience Software registry key. 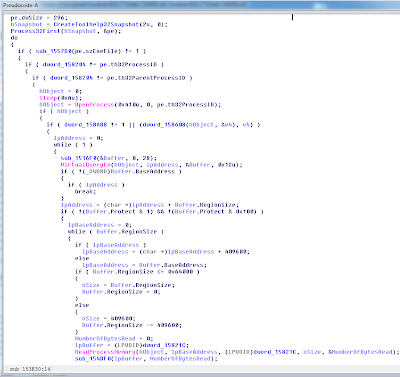 What you see here is the "memory dump parsing" function. It iterates once for each active process on the system, calling OpenProcess() to obtain a handle, then using VirtualQueryEx() to determine which memory ranges are accessible to the process, and reading them into a local buffer with ReadProcessMemory(). The data is then passed off to two scanning sub-functions which do the real work of deciding which data to steal from the buffer. In summary, though I'm slightly disappointed that the memory dump parsing function is just a ReadProcessMemory() loop, at least I didn't waste much time getting there. Unpacking the malware by leveraging Volatility was as easy as 1-2-3. Lastly, since some of our students in the Windows Memory Forensics training requested videos of common ways we use Volatility, here's an initial example in quicktime format showing the steps described in this blog: http://www.mnin.org/dexter.mov.zip.